(E) The amendment filed by the patent owner does not comply with 37 CFR 1.20(c)(3) and/or (c)(4). Where a submission made is defective (informal), form PTOL-2069 is used to provide notification of the defects present in the submission. Form PTOL-2069 is reproduced below. In many cases, it is only necessary to check the appropriate box on the form and fill in the blanks. However, if the defect denoted by one of the entries on form PTOL-2069 needs further clarification (such as the specifics of why the amendment does not comply with 37 CFR 1.530(d) -(j) ), the additional information should be set forth on a separate sheet of paper which is then attached to the form PTOL-2069. The defects identified in (A) through (E) above are specifically included in form PTOL-2069. If the submission contains a defect other than those specifically included on the form, the "Other" box on the form is to be checked and the defect explained in the space provided for the explanation. For example, a response might be presented on easily erasable paper, and thus, a new submission would be needed. Where both the patent owner response and the third party comments are defective, a first form PTOL-2069 should be completed for the patent owner (setting forth the defects in the patent owner response), and a second form PTOL-2069 completed for the third party requester (setting forth the defects in the third party requester’s comments). A copy of both completed forms would then be sent to all parties. A time period of one month or thirty days, whichever is longer, from the mailing date of the form PTOL-2069 or equivalent letter will be set in the letter for correcting the defect(s), except as provided in MPEP §§ 2666.05 and 2667. The patent owner may request an extension of time to correct the defect(s) under 37 CFR 1.956. The third party requester, however, is barred from requesting an extension of time by statute. 35 U.S.C. 314(b)(2). If, in response to the notice, the defect still is not corrected, the submission will not be entered. If the failure to comply with the notice results in a patent owner failure to file a timely and appropriate response to any Office action, the prosecution of the reexamination proceeding generally will be terminated or limited under 37 CFR 1.957 (whichever is appropriate). 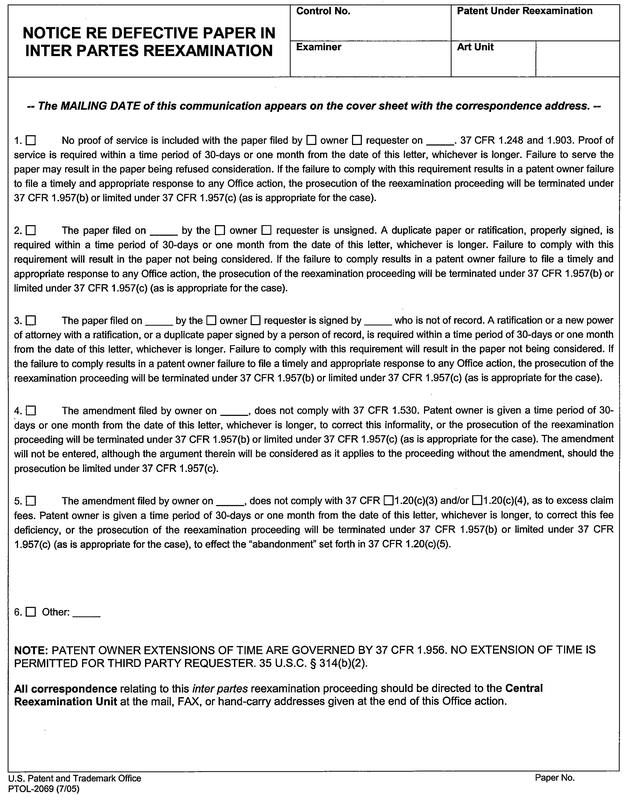 If the defect in the patent owner response or the third party requester comments is limited to a problem with the signature, claim format, or some other obvious defect (easily corrected), and such is noted by the technical support staff of the CRU processing the papers, then form PTOL-2069 may be issued to notify parties of the defect, and obtain a response to the form, prior to forwarding the case to the examiner. Otherwise, the responsibility is with the examiner to obtain the needed correction of the defects in the papers, which defects are either identified to the examiner by the CRU technical support staff or noted independently by the examiner.